When shopping for budget Web hosting services, most providers offer basically the same packages of features, suites, and support. iPage is no different except that it sells its service to you at rock-bottom prices. Created and run by an experienced team of industry veterans, iPage is owned by the Endurance International Group (EIG) which boasts over 2 million domain names. EIG also owns BlueHost, FatCow, GoDaddy, and other hosting services. Since the talent behind those names came together for the iPage relaunch in 2009, the company has skyrocketed, enjoying high rankings consistently across industry and user reviews. If you have next to no budget—or, like me, prefer to not spend any more than you have to, iPage is worthy of a look. In an apples-to-apples comparison, iPage has essentially the same features and benefits as the competition at less than half of the price. Why pay more when you don’t have to? As with most budget hosting services, iPage is an attractive option for newcomers. Personal bloggers, small-business owners, and artists can benefit from the company’s content management and e-commerce tools that are included with the basic hosting plan. Larger-scale operations will find iPage useful, as well; but, the company primarily markets itself to the mom-and-pops out there. With an anytime-money-back guarantee, I’d say that iPage is ideal for first-time website builders who may want to create a blog site or an e-commerce store due to its pricing and easy-to-use Web building tools. You won’t find any iPage templates with this hosting service. That is not to say that you don’t have access to hundreds—even thousands--of templates and themes, though. Instead, iPage has a number of different third-party scripts and Web builder tools available to you that offer plenty of templates for your site. The Weebly Web builder has over 100 customizable templates built in and WordPress (and the WordPress community) gives you thousands more. You can even find some more in the goMobi and CM4all site builders found in the iPage control panel. Just because iPage doesn’t have any of proprietary templates doesn’t mean that the company doesn’t make any available to you. From start to finish, I found it very easy to work my way around the iPage environment. Account set up was a snap—just watch out for those pesky third-party add-on up sells. After I signed up, iPage sent an email that prompted me to login to my account and I was up and running. While not the industry-preferred cPanel, the iPage control panel is quite similar and just as easy to use. With a few tabs to organize the tasks, I had no trouble finding the tools that I needed to work on the website, set up emails, and add marketing information. Plus, no matter where you are in the control panel, there is a button that you can click that opens a help window with access to tutorials and the iPage knowledgebase. I was really impressed with the Weebly Web builder tool. It was very easy to use and highly intuitive. With just a few clicks, I was able to select templates, add and edit images and text, create additional pages for the site, and even design a mobile version. Once satisfied with the look and functionality, I was able to publish it to the Web with one mouse-click. Widgets were available to include social media icons, surveys, multimedia files, and even products for online stores. With no experience and in very little time, I was easily able to produce a professional-looking webpage. There is no need to beat around the bush; iPage pricing can be as confusing as it is inexpensive. The company offers the Essential Plan for basic shared hosting. For this service, there is usually some sort of iPage discount. Although prices are always subject to change, the Essential Plan can usually be found for about $2.00 a month. I started to fill out my account creation form and had to step away from my computer for a few minutes. Upon my return, I had received an email offering me three months for $1.00 a month! I quickly took advantage of that offer. You’ll want to remember that if you decide to give iPage a try. After the terms of your first deal are over, iPage renewal pricing kicks in based off of the length of your plan agreement (one, two, or three years). 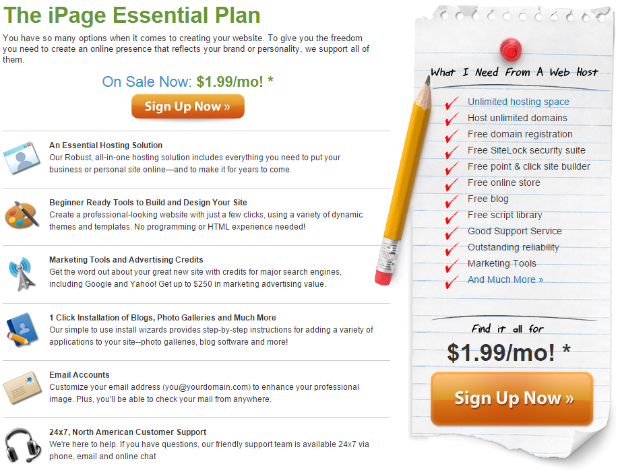 There are other iPage plans for you, should your hosting needs expand. The host also offers Cloud-based VPS hosting with Basic, Business, and Optimum plans ranging from $24.99 to $99.99 a month. 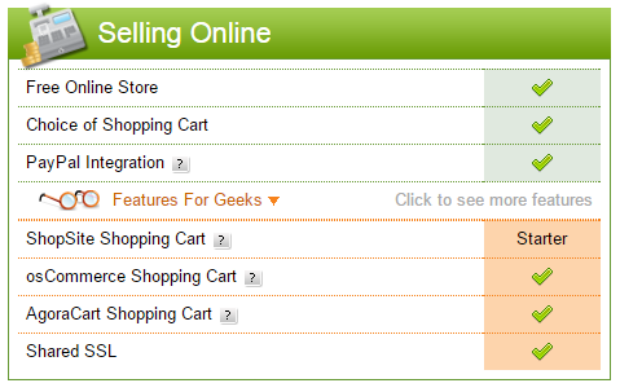 Currently, the site is reflecting discounted prices that you can get without having to use an iPage coupon. If you need even greater control and managed support, iPage has a dedicated hosting plan with Startup, Professional, and Enterprise plans priced from $149.99 to $239.99. I was thrilled to see how easy it was to create a fully-functioning and smooth-looking mobile website with iPage. Most of the other sites I have reviewed either could not support mobile Web pages or had to use WordPress to make one. The Weebly Web builder has a mobile version workspace that automatically turns your page into an iPage mobile site. You can edit as needed, use widgets to add items such as social media icons, and move all of the parts around for a fully-customizable page. This was included in the basic pricing plan. Why can’t all hosts do this?! E-commerce is one area where this company really stands apart from the budget-hosting crowd. All plans come with an attractive e-commerce package that includes a free iPage online store, your choice of three shopping carts, and Pay Pal integration. While the Essential Plan has the basic version of a ShopSite cart bundled into it, the Manager and Pro plans allow for upgraded iPage e-commerce options. The SSL certification gives you and your iPage store customers some peace of mind when transmitting sensitive information like credit card numbers. I found a lot of value in the iPage e-commerce package. Given the fact that iPage offers basically the same features as its budget-hosting competition, finding ways in which it is different might be challenging, or so you would think. It was not difficult for me to come up with a number of areas in which iPage shines and a few where it lose some of its luster. SEO Tools: Aside from advertising credits, SEO options are virtually non-existent. I’ve seen some mixed reviews for iPage customer service. The company has live representatives available 24/7 via phone, email, and chat. While the phone help gets good marks, the iPage tech support through chat may sometimes cause a few headaches. A few reviewers seem to think that the chat service may be outsourced to non-English speaking countries, resulting in some responses getting lost in translation. Aside from that, the consensus was that the team was very knowledgeable. The iPage help staff is internally monitored so that strict quality assurance standards are met. I find this to be an effective way to have consistency across the customer support team. All representatives are properly trained to answer your questions. If you stump them, they will direct you to an iPage tutorial rather than guess and exacerbate the problem. Which brings me to another aspect of its support. In the Control Panel, there is a page devoted entirely to customer support. You will find links to the searchable knowledgebase, user guide, and interactive walk-throughs. You can also create and track help tickets. If needed, you can even upgrade to a dedicated hosting expert through its Web Concierge Program. You can’t expect to get everything for $2.00 a month. The SEO package from iPage is not going to blow you away. However, you are going to get pretty much the same marketing tools and advertising credits that other budget-hosting services offer. You won’t find any SEO-specific assistance; but, you will receive $250 in credits for search engines including Google, Bing, and Yahoo. The company does set you up with a free Yellowpages.com listing, for what it’s worth. Still, you could be getting these exact same SEO benefits and be paying maybe 10 times more for your hosting service. Because of that, I am not going to knock iPage for SEO tools too severely. I’m not going to do backflips over them, either, though. While most of my iPage hosting review has focused on the iPage Essential hosting plan, there are quite a few other hosting options available for you. Beyond the previously mentioned benefits, the Essential Plan comes with a security suite, around-the-clock network monitoring, and visitor analytics. For added security and the agility to react to traffic spikes, you might need VPS iPage hosting. It costs a little bit more; but, you get greater storage, more pre-installed scripts, and the cPanel for your control panel. Dedicated iPage Web hosting offers the same features as VPS, just with completely dedicated resources for you to configure as you like and even further expanded storage capabilities. I’ve read quite a few iPage Web hosting reviews that find the dedicated plans to be excellent values. For a budget-priced hosting service, iPage email options fall in line with what you would expect. You’ll get unlimited email addresses and POP3/IMAP email accounts that let you create email addresses for all individuals or positions within your organization. There are iPage email settings so that you can forward emails, customize spam filters, and run virus checks. I appreciate the fact that you can check your iPage mail via WebMail, too. If you are like me, you are constantly on the go and need to access your mail from anywhere. The control panel has multiple iPage mail settings sections that let you create mailboxes, login to WebMail, establish catch-all filters, and manage spam. One feature that isn’t included is an iPage chat option. However, in the control panel, you can find chat add-on and plugins through MOJO Marketplace and Simple Scripts. If you need a chat feature on your page, grab one that you like and insert it into your site. From what you can probably gather, iPage has enjoyed some very favorable reviews. Most of them involve some sort of accolades for value or iPage promo pricing. Offering the same services and features as your competition at a fraction of the cost will have that effect. You’ll find reviewers that focus on conveniences like being able to use your iPage login to access your iPage WebMail from any computer. Speaking of convenience, the easy-to-use control panel is well-received by user and industry reviewers, alike. The only real knock that I saw was for the iPage live chat for customer service. From what I could discern, the live chat service may have been outsourced and the representative may not have been from the U.S., thereby creating some language issues. Other than that, the responsiveness of the customer support rates very highly, consistently across industry reviews. I didn’t come across any free iPage offers while I was working on this review. I’m not so sure that you need a free offer, to be truthful. With constant promotional pricing that reduces the regular pricing structure considerably—plus the fact that iPage is already charging a fraction of what its competitors are, why would it give it away for free? It doesn’t have to. If about $2.00 a month is too much to spend, you can try the tactic that I inadvertently did and pause during the account creation phase until the sales staff contacts you with the $1.00 a month offer. If that is still too much to cough up, keep in mind the anytime-money-back guarantee. Other than that, getting all of this value for less than a latte a month seems like a no-brainer. As you can see, I am fairy bullish on iPage. It offers a comparable service in the budget-hosting category, run by experienced industry professionals for a price that simply cannot be beat. I was thrilled with how quickly I was able to get my Web page created and published online. The control panel and Weebly site builder were easy to use—even for someone new to both of them. My site was stylish, responsive, and easy to edit. I have no trouble recommending this company to anyone. The anytime-money-back guarantee helps to alleviate any apprehensions, too. For $2.00 a month, why not, right?